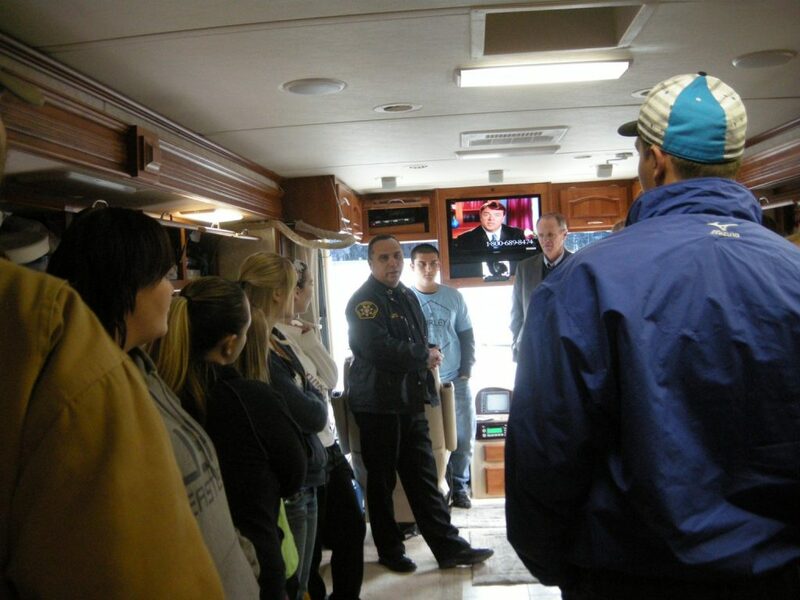 With a 40-foot motor home outfitted with all manner of technologies, Carbon County Sheriff James Cordova and Deputy/Emergency Manager Jason Llewelyn spoke to Dr. Richard Walton’s criminal investigations class at Utah State University-Eastern about the evolving world of law enforcement on Feb. 8. Fourteen years ago, when Cordova took office, he made a goal to bring technology and equipment up to date within the sheriff’s office, allowing for improvements in public safety, communication, and other equipment for assisting other agencies during crimes, emergencies, and larger incidents. The events of Sept. 11, 2001, led the president of the United States to pass new laws which gave federal-grant money to states for updating equipment and training. Since then there has been a wider exchange of information between emergency management personnel throughout the U.S. This change in the information exchange can be observed by the increased amount of computer equipment in the patrol cars, the more readily available information on the websites of the FBI and other government entities and even the county motor home and trailer- mobile command centers that took the place of tents and ambulances. This command center, the product of quarter of million dollar grant acquired over a three-year period, has worked as a central location allowing the sheriff, incident commanders and various dignitaries including Gov. John Huntsman to work privately on the scene. Cordova emphasized that during the Crandall Mine disaster, the motor home was a daily office for Huntsman and conference calls were regularly made to the White House during that catastrophe without interruption. The command center is outfitted with state of the art communication equipment as well as enough food and water to keep the emergency administrative staff comfortable for three or four weeks at a time, if necessary, as well as to keep them from dirtying evidence. “Any destruction of evidence hurts our scene. I’ve been kindly asked to go in there. Please, don’t contaminate our scene,” said Cordova, lightheartedly. Deputy Llewelyn and the county hazmat team, train to the same standards as teams in more populated areas and federal agencies and have modernized the manner in which evidence is collected in Carbon County. In suits that look worthy of a space expedition, they deal with a number of gasses and substances that deputies would once have risked life and limb to collect and eradicate. Sheriff Cordova emphasized the revolution in law enforcement technology with an example of a body recently recovered through a Price City sewer manhole. Where 27 years ago, when he started working for the department, he would have been in waders leaving DNA on evidence. He now coordinates, from the scene, with incident commanders, assisting agencies, and the district attorney, while deputies work through the sewage in contaminant-free suits. This process, by eliminating the contamination added by emergency responders without proper resources, and managers without an out-of-the-way place to control operations, at least halves the time it taken to process evidence at the state crime lab, Cordova noted. The days of Andy Griffith and Marshall Dillon are very much a thing of the past, even at the outposts in rural Eastern Utah. According to Sheriff Cordova, “Playing catch up is far too difficult. I prefer to keep up to date with technology. This makes everyone’s job easier, safer, and more efficient.” With that policy in the evolving world of law enforcement, in 10 years, the Carbon County Sheriff’s Department today could be nearly as archaic as it was under Matt Warner a hundred years ago.